Catalyst Project: a center for political education and movement building | Statewide Mobilization Against Militarization! Say No to Urban Shield! This September, Alameda County will bring together law enforcement agencies from across the country and world for the annual Urban Shield convergence, a highly militarized SWAT training and weapons expo. It exists for police units to share repressive tools, tactics, and technologies, and learn how to better control and harm our communities. 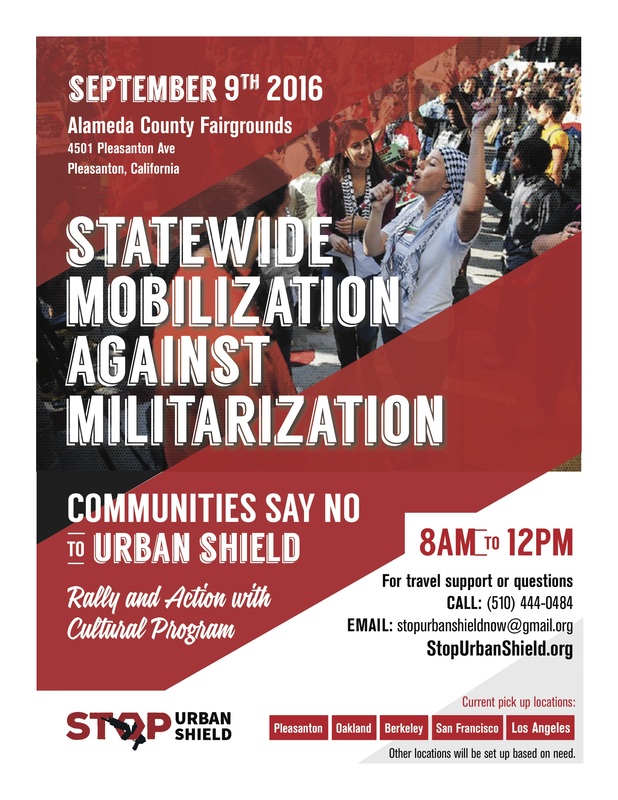 The Stop Urban Shield Coalition and many across California are organizing a mass mobilization on September 9 in Pleasanton, CA, where the Urban Shield weapons expo will be held, and are calling communities everywhere to join us. In 2014, due to our organizing and grassroots mobilizing, we were able to kick Urban Shield out of Oakland. This year, with community support and power from across the state, we can kick Urban Shield out of the Bay Area, and put an end to it for good! Want to learn more about what Urban Shield is? As part of building community resistance, we have been hosting a series of town halls and educational events. Check out a recording of an information webinar we held in August. Please share our informational flyers, available in English, Spanish, and Arabic. For more info, you can visit www.stopurbanshield.org, or email us at StopUrbanShieldNow@gmail.com.